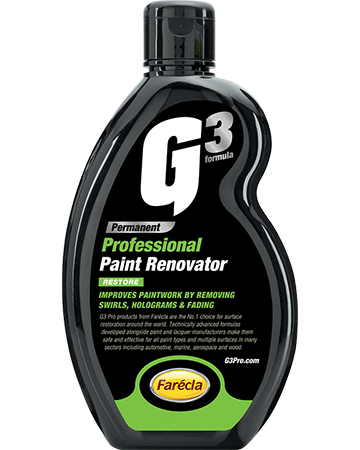 ​​​​​​​G3 Pro Paint Renovator uses a gentle blend of Engineered Diminishing Abrasives (EDAs) to effectively remove swirl marks and other small blemishes, as well as restore colour and shine to faded bodywork panels. Trying to remove deeper scratches, try G3 Pro Scratch Remover. G3 Pro Paint Renovator is a milder product than G3 Pro Scratch Remover but not as light as G3 Pro Colour Restorer. Ideal for use after G3 Pro Scratch Remover if swirl marks or light scratches occur.